All Rolex watches have a “main spring” that provides the necessary power to keep the moving parts in a mechanical watch movement moving. Winding or tightening the spring creates tension. That tension is released as energy when the spring is allowed to unwind or uncoil. As a result, the spring will eventually fully unwind and the watch will stop running just like taking the battery out of a quartz watch. With a Rolex watch, there are two ways to keep it wound. The first is by the winding rotor. The second is by the winding crown. If you wear your Rolex watch daily, most likely you won’t have problems keeping your watch wound because all Rolex watches are designed with a self-winding or “automatic” movement. Here’s how it works: there’s a weighted rotor connected to the main spring of the watch movement. That rotor spins whenever the person wearing their watch moves. 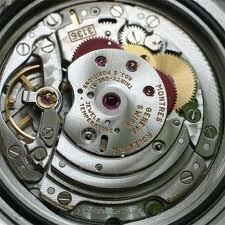 When the rotor spins, it winds the main spring which powers the watch movement. So, as long as the wearer doesn’t have a terribly sedentary and inactive lifestyle, natural body movement should keep a Rolex optimally wound and running. But not everyone wears their Rolex every day. Maybe you wear it only on special occasions. Or, maybe it’s one of several watches that you wear on a semi-regular basis. When fully wound, most Rolex watches will continue to run for about 50 hours until the main spring fully unwinds and they stop. So, even if you don’t wear your watch for a couple of days, say, over the weekend, it shouldn’t be a problem. But for a more extended period of not wearing the watch, there are several options available. One option is to hand-wind the watch via the winding crown. Simply unscrew the crown and gently rotate it clockwise between the thumb and forefinger for approximately 20-30 full revolutions. Don’t worry about over-winding the watch. All Rolex watches have a clever slip clutch designed into the mechanism which protects the main spring from being over wound. Tighten down the crown once done. Your watch is again ready to wear. But winding and resetting the time and date can be tedious – particularly for someone who owns several different watches. The marketplace has responded to this particular problem with the advent of the watch winder. A watch winder is a device which can accommodate one or even multiple watches. It periodically rotates or moves to simulate the natural movement the watch would receive if worn. This simulation keeps the movement of an automatic watch fully wound. Now, the watch is ready to wear whenever the owner chooses without first having to wind and set it. Also, these watch winders are normally interval programmable. However, watch winders, much like Rolex watches, aren’t cheap. So many people opt instead to simply store their Rolex watch for relatively extended periods until they want to wear them. Just be advised that there are various lubricants, such as oils and grease, which are used throughout the watch movement. These lubricants are fairly evenly distributed so long as the movement continues to run. However, extended periods of inactivity may cause these lubricants to pool and congeal which could severely impact both the precision and longevity of the movement. Newer Rolex models can better handle extended periods of inactivity better than older, vintage Rolex models. But, a good rule of thumb is to fully wind a Rolex once every couple of weeks if it hasn’t been used during that period in order to prevent problems. One final word about keeping a Rolex wound and running – never shake a Rolex to wind it. Some people think it’s necessary to violently shake a Rolex in order to make the winding rotor spin and wind the watch. This is never a good idea. Rolex makes one of the industry’s most robust watch movements. However, it’s still a precision instrument that is susceptible to both shock and impact. When worn, the natural movement of the arm is enough to spin the rotor which winds the movement. If not worn, the best way to wind the watch is either to hand wind it or place it on a watch winder. Now that there’s a better understanding of the day to day requirements to keep a Rolex watch properly running, Part II of this article will look at the longer term maintenance requirements of Rolex ownership.